Earlier this year it dawned on me that the configuration of Christmas and New Year’s landing on Tuesdays meant that I could take from December 22nd through January 1st off – 11 days – using exactly two vacation days. Surely anybody who knows me, knows that I look at this as an opportunity to go as far away as I can. I started exploring my options, doing serious research on South Africa (Durban – on the coast), Australia (Perth, Brisbane, and Sydney), and Cape Verde. After much dithering, I finally settled on South Africa, only to discover that there were no longer frequent flier tickets available, so I had to hop back into destination determination mode, this time looking at Bogotá, the third highest national capital, after La Paz and Quito (been there, done that – I think you can smell the start of a new list for me to complete). 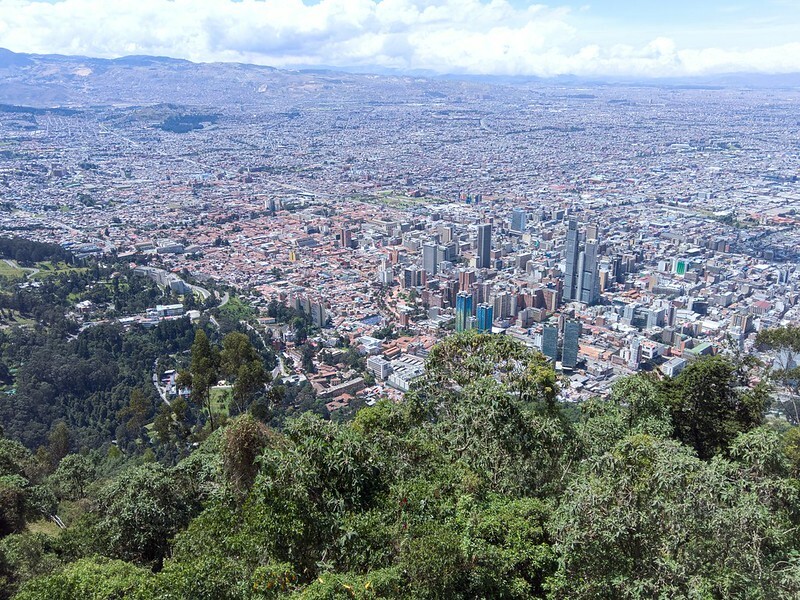 The choice of Bogotá was aided by the fact that Avianca was starting a flight from Munich to Bogotá in late November: award seat availability was wide open – 160,000 miles later I had reservations at the pointy end of the 787. At 12 hours and a red-eye each way, I decided the opportunity to sleep lying flat and in relative comfort was worth it. Further, as I would be arriving on December 24th, I decided it would probably be wise to book myself into a full-service hotel so that should Bogotá grind itself to a complete halt with 100% of the restaurants closed, I would at least have the back-up option of room service. I burned Hilton points and reserved a room for a total of 7 nights. So my itinerary looked as follows: I arrived on December 24th at 4am, stayed 7 nights, then departed on December 31st at 10:45pm. Not only did I get to spend time some place warm and sunny, I would also neatly avoid my least favorite day of the year in Germany: Armageddon New Year’s Eve. As I write this, I am winging my way back to Europe, feeling a bit melancholy for specific reasons that I will not divulge on the blog – but also having experienced midnight onboard a plane. The friendly flight attendants passed out Champaign shortly before midnight, then announced the arrival of 2019 (twice), followed a few minutes later by what I can only assume is a traditional Colombian song to welcome in the New Year. It was sweet, endearing, and fun. With respect to my time in Bogotá, this was not my most densely action-packed vacation, but I will blame the combination of being there for the Christmas holidays and the fact that Bogotá is at 2600 meters (8530 feet) – which threw me for a serious loop the first 24 hours after landing and continued to noticeably affect me throughout my time there. 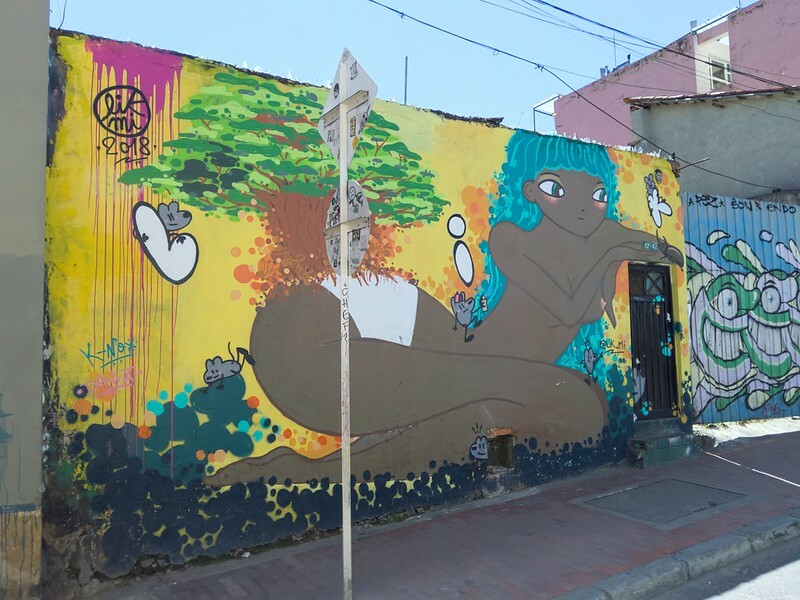 The Bogotá Graffiti Tour, which I took on December 25th, along with 25 other people looking for something to do in Bogotá on Christmas Day, was a densely packed 2.5-3-hour tour of graffiti in the Candelaria area of Bogota; in theory we were supposed to also look at graffiti in downtown, but we never quite made it. The tour guide was passionate about graffiti, taking about its history. She claimed it started in the last century, but I would be willing to bet that the Romans would disagree. She also defended tagging as legitimate – and while I can see how youthful tagging can, in a few select cases, lead to artists who improve the visual landscape of a city, tagging itself is something I abhor. 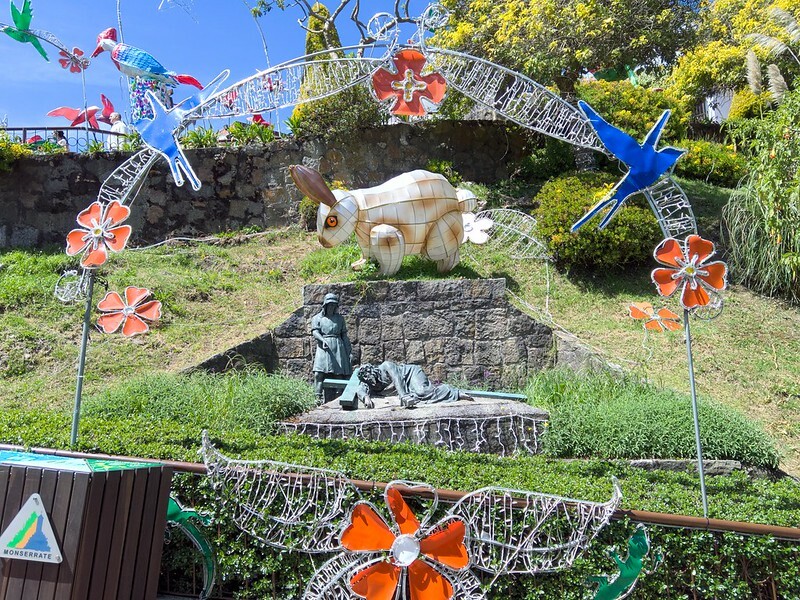 Weaving Peace, a specialty, individual, tour offered by Impulse Travel, is a tour focused on how Colombia is recovering from ~60 years of violence. The tour was excellent, including stops at a chocolate shop that is the outcome of local farmers moving from cocaine to cocoa. On the tour, I got to meet the son of one of the leaders and we spent 45 minutes to an hour talking about the history of conflict. We also stopped at a coffee shop run by a remote community that has made a similar shift from poppies to coffee, spending another 45 minutes talking about the community and how its indigenous citizens are reclaiming their identity and language. What really shocked me, ultimately, is how brief the history of cocaine and poppies are in Colombia. Following a brief visit to the reconciliation memorial, we went to a restaurant where the food is all locally sourced, with the chef explaining each dish and where the ingredients came from. I would enthusiastically endorse this tour. The “De La Mesa” Bogota Food Tour was also quite good – there were 6 of us wandering the streets of Bogotá sampling local foods, including, first, coffee, followed by chocolate. It was much to my amusement that we went to the same chocolate shop that I had been to on the Weaving Peace tour – but the information presented was substantially more superficial—but given the pricing differences, group size differences, and available time, this was fine. The food tour continued –including a decent amount of historical context: while it was scheduled to last 3 hours, ultimately it was 3.5 hours. I should have taken notes – but I believe we ended up visiting four more spots. Regardless, I was stuffed. I could not finish everything presented to me – which I think was true for every member of the group. At US$55, this tour is an excellent value and well worth the effort. However, I would skip breakfast and not make dinner plans. 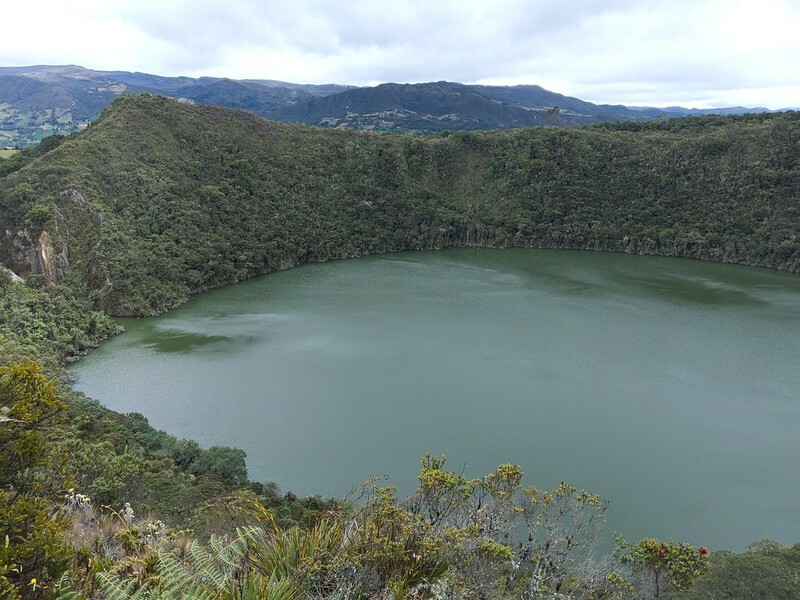 I also visited the Guatavita Lagoon and Zipaquirá Salt Cathedral, again arranged by Impulse Travel. I was picked up from my hotel and driven directly to the Guatavita Lagoon, which is a lake high in the mountains (hello 3100 meters!). It was here that the indigenous people used to leave gold offerings to the gods – the lake was then partially drained by the colonizing Europeans – in a way that destroyed the ability for the lagoon to ever fill completely back up. My tour guide was outstanding – we ended up meeting another English language tour guide and traveler – we hung behind the main group getting information about the history in English. The lake is only accessible with an official tour, with official tours only in Spanish – both tour guides find this language limitation incredible, noting that a few years ago the official tours were offered in either Spanish or English and that they did not understand why the official English tours were eliminated. Following the lagoon, we went to Zipaquirá, where we had a lovely meal in a meat restaurant, before heading to the Zipaquirá Salt Cathedral. What I’ll say about the Salt Cathedral is that it’s amazing what happens when the creative juices of miners are channeled. 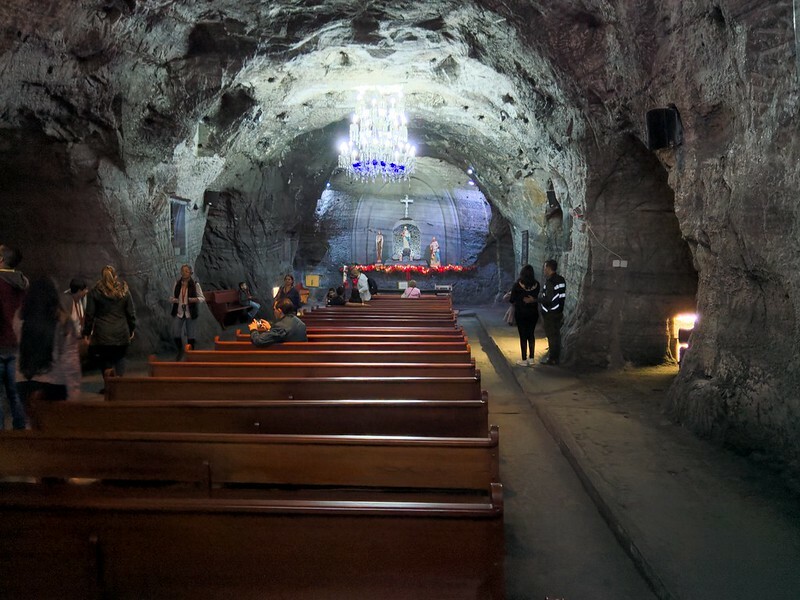 There were many beautiful vistas within the mine – but as an atheist, much of this was lost on me: multiple carved Jesuses and crosses, all made of salt is nice, but not something I need to dwell upon. Beyond these professional tours, I did some independent wandering. 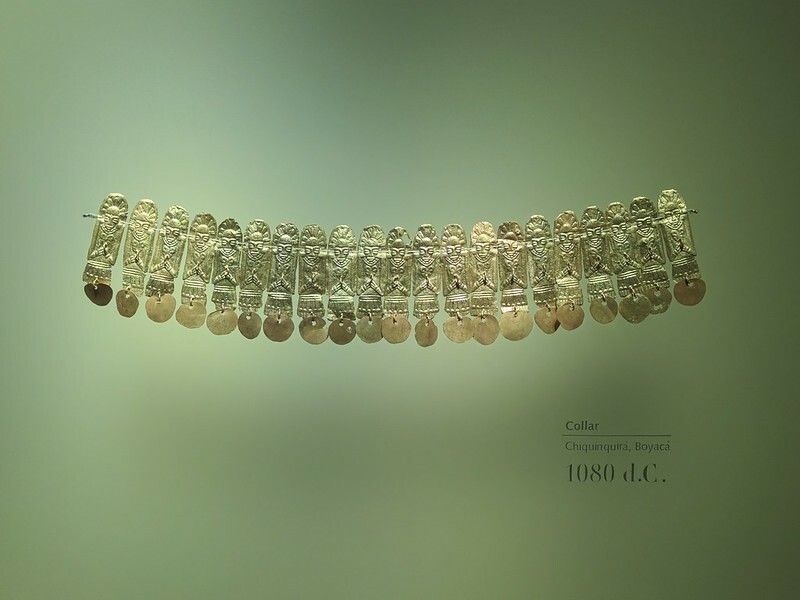 The Gold Museum is absolutely outstanding – I cannot say enough nice things about it. It’s a very good idea to show up early, just after it opens. When I got there, the queue to get in the door consisted of one person (me! ), when I left the queue was probably 20-30 minutes long. The museum is overwhelming – and it is impossible to look at everything, unless you plan to spend the entire day in the museum. I also passed through the Botero Museum, which, if you like his style of art, is amazing. It’s not really my thing, so my visit was relatively short. My next to last day in Bogotá, I visited the top of Monserrate, one of the mountains surrounding the city. Normally there are two reasonable ways up the mountain: aerial tram or funicular. The aerial tram was out of commission, so it was an hour long wait to ride up the funicular. There is a walking path up the mountain, but there was no way I could make it, given the elevation. 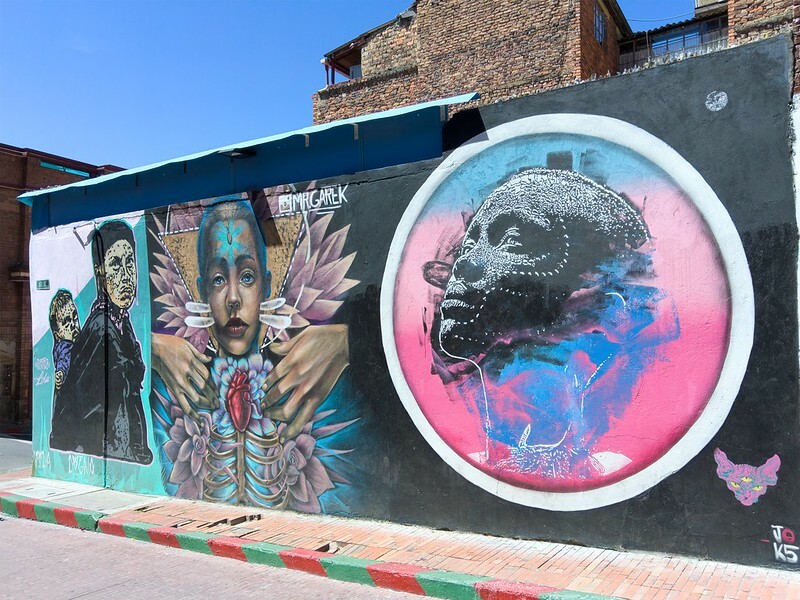 The rest of my time in Bogotá was spent wandering… the city is quite good for that.